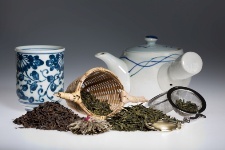 In China, the healing properties of tea have been recognized for thousands of years. But in the West, it has taken longer for tea to get the credit it deserves. One tea that has long been used in China, but is new to many in the West, is pu-erh. In fact, it’s a tea that has extraordinary antioxidant content. Researchers at the Department of Tea Science in China’s Zhejiang University recently studied pu-erh tea to determine which bioactive substances were responsible for pu-erh tea’s reputed health benefits. The research team found pu-erh contained the following: tea polysaccharides; caffeine; protein; and amino acids—an eclectic list for any tea. But, what was even more remarkable was that pu-erh was found to exert some serious antioxidant activity and potent inhibitory effects against alpha-glycosidase. Alpha-glycosidase breaks down starch and saccharides into glucose. Slowing this process down can help to control your blood sugar. What’s more, all of the substances worked together to exert an overall beneficial effect on hyperglycemia in diabetic mice as compared with a control group. In fact, pu-erh tea extracts acted in much the same way as a popular prescription diabetes drug, acarbose, when matched dose for dose in the diabetic mice. Pu-erh may not yet be popular in the West, but it represents a potentially effective natural remedy for people hoping to gain control over their blood sugar levels. Huang, Q. et al., “Studies on the bioactivity of aqueous extract of pu-erh tea and its fractions: in vitro antioxidant activity and α-glycosidase inhibitory property, and their effect on postprandial hyperglycemia in diabetic mice,” Food Chem Toxicol. December 1, 2012; pii: S0278-6915(12): 00846-0.